Chicquita shed her maiden tag in the best possible fashion with victory in the Darley Irish Oaks at the Curragh. Alain de Royer-Dupre's filly would have been an easy winner at Saint-Cloud in May but for hanging badly before colliding with a hedge and falling, and she was again awkward when second in the Prix de Diane on her last start. She gave Johnny Murtagh plenty to think about here, too, as she dramatically veered to her left in the closing stages. Her drift started at the furlong pole, but such was her turn of foot she was still able to prevail in a blanket finish from the late-charging Venus De Milo, who did have the winner crossing in front of her close home before going down by half a length. Just Pretending and Riposte had looked like battling out the finish before Chicquita (9-2) appeared on the scene, while Venus De Milo ran a cracking race on just her third racecourse appearance, closing all the way to the line. A stewards' inquiry was called, but the placings remained unaltered. Royer-Dupre said: "It is quite different to my last winner of this race, Shawanda, because she was unbeaten and this one, she had never won before. She is a great filly and I wanted to try another Group One rather than to go into an easier race. "Her temperament is very interesting because she is very quiet in training, she never does anything wrong, and in the afternoon sometimes she goes to the left. She is quite tricky to ride in a race. 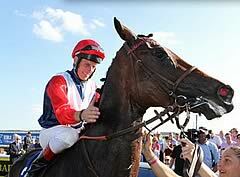 Johnny Murtagh did well as she is not easy to ride. He got her relaxed and I told him when he asked her, to do it gently and not to surprise her. "The Curragh is a marvellous track, one of the best in Europe and if you have a good horse to come here, you are sure to show something. She's the best filly I have in my yard. That's why I decided after she fell back in Saint-Cloud to go straight away to the Prix de Diane, because I know she has talent. "I'll never know why she flew into the hedge at Saint-Cloud that day, I think she wanted to come home too early. She will probably go now for the Prix Vermeille and then maybe the Arc. I think she is good on any ground." Murtagh, who went on to a treble on the card, added: "It was pretty straightforward really. She has drifted out, but she is difficult. She's done it before. When she drifted out, I let her go because I didn't want to be carrying anything wide. Seamie (Heffernan, on Venus De Milo) was coming behind me but he never stopped riding. The best filly won on the day. "The stewards' inquiry went on for a while, but it was never in doubt. I gave her one little flick and and when I did she went left. At the line she really went left, she nearly threw it away, but she won well. She's a very, very high-class filly. She has lots going on in her mind but if Alain de Royer-Dupre can channel that energy, she's a seriously good filly."